Learn & Play! teamLab Future Park is the latest exhibition by Japanese art collective teamLab. Featuring eight interactive light installations never seen in Australia. Future Park is now at the Powerhouse Museum! 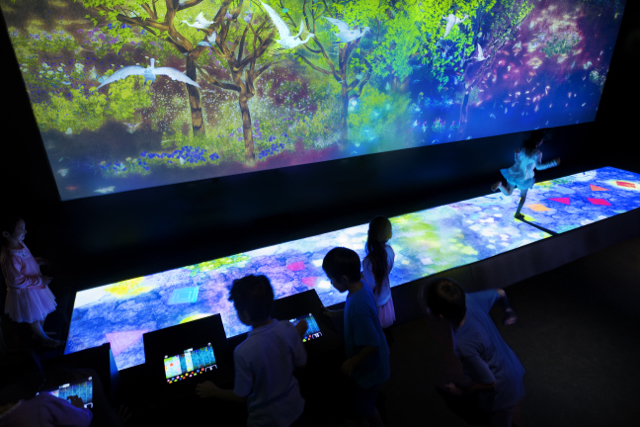 As the first teamLab interactives to come to Australia, Future Park is a playground for children and adults alike that brings together science and imagination to create collaborative artworks that change and evolve each day. Visitors will be swept into jungles of dreamt-up forests, compose symphonies, build cities and invent animals and people of the future. Future Park features 8 installations that evolve in real time as they respond to human interactions with the art. Visitors will have the opportunity to make music with Light Ball Orchestra as balls small and large, suspended and rolling connect with each other to create a live composition. This ever-changing symphony is combined with a light show as the balls change colour as they interact. Hopscotch for Geniuses gives a new, digital twist to one of the world’s oldest games. Part interactive dance, part traditional hopscotch, this is a game that will keep people on their toes. Graffiti Nature - Mountains and Valleys creates a magical digital environment to be populated by visitor drawings of animals and plants. Witness a colourful world grow from a shared vision of what was, what is and what could be. Sketch Town invites visitors to populate a town of their collective imagination by drawing vehicles, buildings and public places. As Sketch Town grows its creators can interact with the townscape they have designed. Sketch People: Sketch yourself some new friends, scan them and see them come to life on our large screen. You can even interact with them as they form relationships with one another! Sketch Town Papercraft: Turn your 2D drawings into unique 3D memories to take home with you as you breakdown the barriers between the digital and the physical. Draw and colour your favourite Sketch Town images, scan your drawing, print it out and assemble your 3D model. As part of MAASive Lates: Digital Worlds, be among the first to see Future Park on Thursday 23rd Nov when preview exhibition tickets are available for one night only . MAASive Lates at the Powerhouse Museum is a quarterly night of free entertainment and interactive experiences. Also make the most of late Summer nights at the Powerhouse Museum when the exhibition stays open until 9pm every Thursday in January with adults only sessions to Future Park. Learn & Play! teamLab Future Park will be open from Friday 24th of Nov 2017 until Saturday 30th of April 2018 at the Powerhouse Museum in Ultimo. Prices are: Adults $28 Concession $22 Children $17.30 Family Pass $74, Members and kids under 4 free. For more information and to book tickets to Learn & Play! teamLab Future Park at the Powerhouse Museum, head to their website.